Sydney’s screen community came out in force on Tuesday night to Metro Screen’s forum, You’re On Your Own Kid, to consider its response to Screen Australia’s cuts to the sector. We no longer feel alone!! Thank you to everyone who was there on the night – both future and established filmmakers and also representatives from Screen Australia, Screen NSW, Australian Directors Guild, Screen Producers Australia, Australian Writers Guild, Screenrights and the Arts Law Centre. We’re not out of the woods yet but its great to know that so many people across the industry share our serious concerns about screen pathways and what our screen culture will look like in five years time. But there wasn’t enough time on the night… While it’s still fresh we’d love to get your feedback on the state of the emerging sector, Metro Screen’s future and/ or your screen career journey. If you weren’t at the forum we also want to hear from you. Send us an email to have your say. Pitch your way to your first industry deal! 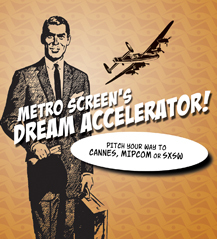 Applications for the 2014 Metro Screen Dream Accelerator are now open. Be part of a national pitching event to land yourself $3000 to help get your dream project up and running or use the cash to take your project to a festival market. 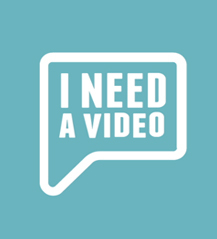 Submit a 3 min video pitch and sell us your dream concept in our Dream Accelerator. 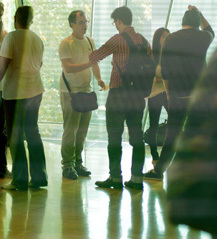 Spend one day with the world's foremost Transmedia producer (Avatar, Pirates of the Caribbean, Coca-Cola). Dive deeper into Transmedia than you ever have before. Due to popular demand, Jeff Gomez returns to Australia for this series with exclusive new material. Sydney Wed 8 Oct 2014. Gateway LA script dev program final call 12 Sept! Australians in Film has secured the support of a number of high profile film executives to judge the Gateway LA script development program. Writers have just ten days left to make their submissions to the program that supports projects from Aust writers with cash, flights and LA meetings closes 12 Sept. The Motherf**ker with the Hat is a gleefully foul-mouthed look at modern love and other addiction playing at Eternity Playhouse 19 Sept – 19 Oct.
One day workshop led by award winning cinematographer Steve Arnold (Red Obsession). Sat 13 Sep.
All you need to create effective and engaging documentaries. Starts Sat 20 Sep. In just 4 days you’ll be introduced to editing using Adobe Premiere in small class situation with the latest version software. Starts Sat 20 Sep. Pitch your way to your first industry deal. 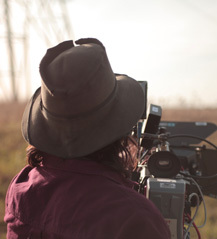 Emerging Producers, this is your chance to get in front of industry heavy weights at Screen Forever 2014 and win $3000 to take your project to the next level. Submit a 3 min video pitch for your idea – grab a phone, ipad or your mate’s camera and sell us your dream concept in our Dream Accelerator 2014. Application deadline Tues 7 October. Find out more. We have 2 new shiny Sony NEX-FS700 and Cineroid EVF4RVW with Retina Display. 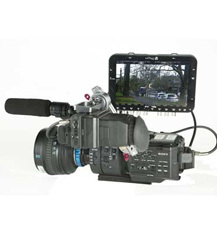 This is a 4K NXCAM digital cinematography camcorder with a newly designed Super35mm CMOS sensor, super slow motion capability and an interchangeable E-mount lens system, offering unrivalled flexibility and creative expression. Sydney Underground Film Festival starts today! Congrats to the winners of our Wish You Were Here ticket giveaway.